Have you ever been golfing in the rain and all of a sudden you had to find a cart to hide under or a tree? What am I saying, of course, you have! We all have! However, that is not the worst part. The worst part is when you realize that your precious and high-quality clubs are getting ruined because of it. If you have been in the rain and are worried about your stand bag or clubs getting ruined, this is the article for you. 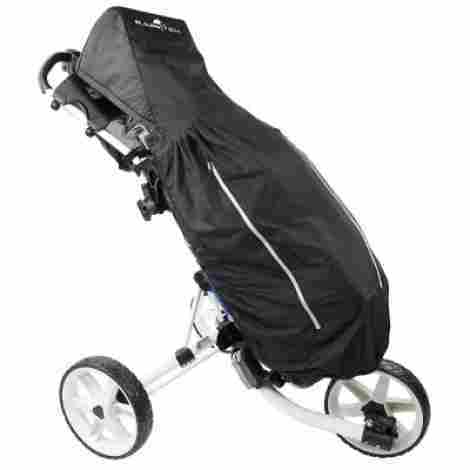 We want to discuss with our readers the best golf bag rain covers. When picking out a rain cover, it is important to consider which features are the best for you, what features you are looking for, and how durable you want the product to be. With that, we found ten different covers, all made from various material designs and all with different features that ensure an individual will have a quality product to choose from. With that in mind, it is important that you measure the size of your bag and then pick the specific product that coincides with the size of that bag because you want to ensure that it will fit properly. So, without further wait, let’s discuss the top ten that golfers can buy today. It is always important to cover and protect your gear. If you have very expensive clubs, you are already imagining the pain of having to replace them due to water damage. Well, now it is time to bring you the first rain cover on our list. 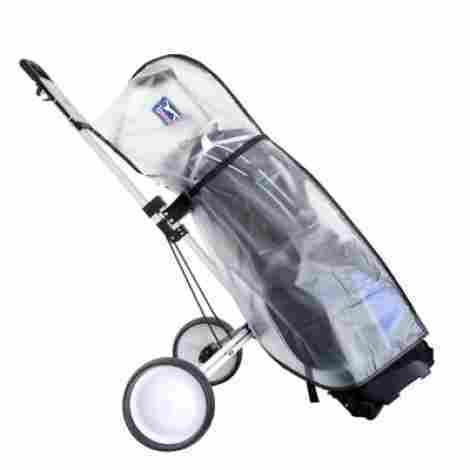 Designed for easy club access and made for three-wheel carts, this is the ProActive Sports Rain Tek Waterproof cover for clubs. This product is made of a high-quality nylon material that happens to be rainproof. Yes, fully rainproof. The design of this product includes a rainproof pocket for easy tracking of a scorecard and it even includes a rainproof design that wicks away moisture and water. This product is designed with a high wind strap that circles around the golf bag. The wind strap is designed for individuals to easily be able and keep their items and clubs safe on the go. It is windproof and it will not blow away or allow for wind to blow inside of the cover, creating a big bulky bubble. As far as cost and value, this item is very high-quality, integrated with some great features that are beneficial, and it has a 4.5-star reviews. Overall, this brand is known for their quality products and designs that last a long time. If you want great benefits, this is the first product to consider from our list. Unique and high wind protection. Designed to last a long time. A bit of wind may get inside from time to time. This next rain cover happens to be very unique and different from many other ones on our list. This item comes from a brand that is very trusted and in the industry is known as a leading brand. From the PGA Tour team, we want to share the Full Golf Bag Rain Cover and two features individuals will find to come in handy from this product. One of the great benefits of this specific design is that it happens to be foggy but clear. This item is made with waterproof PVC material that allows for a cool and modern design that is somewhat see-though. It gives the design a very aesthetic design, unlike most golf covers which are designed completely in black. With this, individuals will enjoy the fact that it is simple to use, take off, and place back on. The zipper of this item is also designed to be waterproof. The zipper is a heavy duty zipper that is rust resistant and can take on a bit of wind and rain. With that, when not in use the best part is that the bag is foldable and can easily be put inside of a box or even the same bag that it comes in. As far as price, this item is priced a bit above average because it is designed from an expert brand in the golf community. Overall, if you want an aesthetic design that is pleasing, simple to use, easy to clean, and easy to pack. This is it! We recommend this product if you want a high-quality cover that is waterproof and will protect your clubs and bag well. Quality design that is made to last. Beneficial design that is simple to put on. High-quality zipper that is rust resistant. Trusted brand with five-star reviews. PVC material is very durable. This upcoming product is the Seaforth Full Bag Slicker. What a cool name! However, is it worth considering? Well, it is designed with a secure fit Velcro snap and elastic band design, it allows for easy access and it is designed from a great brand that knows a thing or two about quality products. Here is the first benefit to consider. The material design of this product happens to be a waterproof and flexible nylon. The nylon is made to be lightweight, easy to install, and easy to remove. It also is built to be easy to take off, clean, and place bag in a box or plastic baggie. It conveniently folds up for easy storage in a bag pocket and allows the user to take it out when they need it most. This item is made with different and important safety features. The safety features include a Velcro snap, elastic band, and an overall high-quality design that is secure and allows for quality protection of your items. With that in mind, golfers will like the overall strength and durability of this product in regards to how it works, functions, and it's designed. To discuss the value and the price, we think this product is worth considering if you want an easy to clean nylon material. Alongside this, the Velcro straps are convenient and allow for quick and easy use. With that, it is easy to clean, easy to install, and comes packaged very well. Quickly wraps around your golf bag. Allows easy access to bag pouches. Material may be very wrinkled at first. This next product has some of the same features as the second cover on our list, but it is made with a thinner PVC material. Time to discuss the two benefits of the Paragon Golf All Weather Cover and what individuals can expect as far as design, benefits, construction value and more. This item is designed of a 0.03 mm PVC material that is intended for all-weather use. Alongside this, it is made to be semi-transparent and allows for easy grabbing and club selection. To add to this, individuals will enjoy the fact that it is fully waterproof and windproof, making it a great choice for the golf course during the cold and windy weather months. This product comes with a zipper design that is very high-quality and brings the product design full circle. The zipper is a heavy duty zipper that is made to be water-resistant and anti-rust. It is also tear and slip- resistant and golfers will like the fact that it is positioned at the very top of the cover for easy access to your clubs and other important items. To add to the value of this item, individuals will discover that it is made with easy maintenance in mind. It is compact so storing it is very easy. 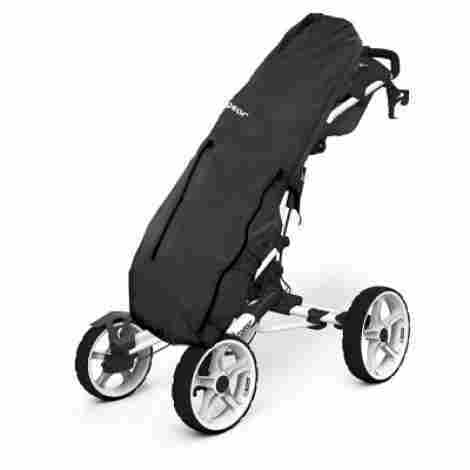 The overall design can fit in most cart bags and stand bags and the construction is durable and well-constructed. To add to the value of this product, we want to mention that this brand excels in the area of quality and this product is only a result of their dedication to great golf products. PVC is 0.3mm thin but very durable. 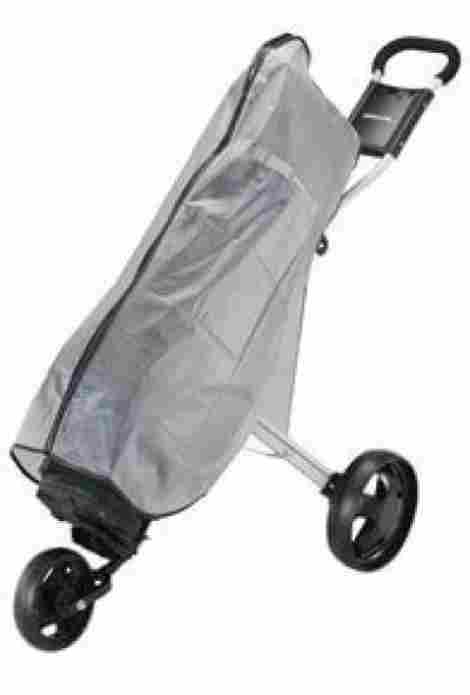 Fits most stand bags and carts. Semi-transparent for an aesthetic design. This next product is the second product from this brand, ProActive Sports. As another quality cover and rain bag, it is time to talk about the Rain Wedge. This design has an easy access benefit, is high quality, has an easy strap system design and attaches to the bag in seconds and stays secure. Made from a durable and waterproof nylon material, here are a couple of great benefits. The design of this item is an easy-access design that allows for an individual to use on hand to flip up the cover and use their other hand to retrieve a club. When not in use, simply flip down the cover and you can rest assured that your clubs will be protected from any rain or wind. This product is designed with a grip clip. The grip clip is an easy strap system that attaches to the bag easily but also stays secure for safety purposes. Alongside this, the strap and grip clip and reinforced with quality stitching and nylon fabric to ensure that it is a fully windproof and waterproof design. In discussing the value, we discovered that this product’s biggest benefit is the locking zipper design and retractable rod system that gives an individual 14” of clearance. With that, the overall price is actually really affordable. The only downfall is that it is designed as a rain hood and cover, not a full bag cover that protects the full bag. Therefore, some aspects of your golf bag may actually get wet. Made of durable and waterproof nylon. The rain wedge wire may come out of the tips. Not as high quality as a full cover. 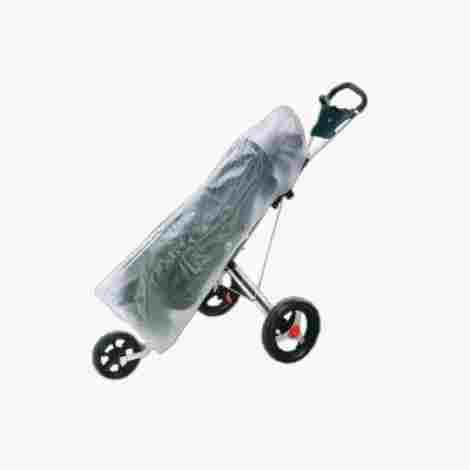 This next product on our list is known as the Big Max Golf Accessory Rain Safe cover. This item is designed to be 100% waterproof, it fits any size golf bag, and the consumer can put their trust that it will protect the bag and the clubs very well. Here are two excellent benefits of this item. This product is made of a Velcro closure and zipper design. This design is a two-tier reinforcement design that protects the bag and ensures that no wind or water will get inside of the product. The zipper is also water-resistant, and the Velcro closures are reinforced with quality stitching to ensure the longevity of the product and safety of your equipment. This product comes with an easy folding design that expands to cover your entire bag in seconds and folds away easily. To add to this, the overall design is 100% waterproof and individuals will find the product easy to clean if it does get wet. It also is compact enough to be placed inside any of the golf bag pockets, so you can take it out at any time. As far as the cost and the benefits, we think individuals will benefit from the full-coverage construction of this product. With that, it has an adjustable strap system and an overall valuable design that makes it a great contender. Use it on the go easily and attach it to your cart when you need it most. Fits most size golf bags. Velcro closure is very high quality. The zipper allows for easy access. This manufacturer is known for two major aspects, customer satisfaction, and durable products. Therefore, we had to include them on our list before coming to an end. This is the Clicgear Golf Rain Cover and it is made with a waterproof nylon construction that is durable and lightweight, creating a great product that is beneficial for all days of the year. This product has a very unique and different design. It not only has an only easy-access zipper at the top for access to clubs, but it also has other zippers on the side for access to your golf bag pockets. With that, the three water-resistant zippers are high-quality, durable, comfortable, and made with a simple design that makes them incredibly useful. The installation process of this item is made easy thanks to the two clip-on adjustable nylon straps. With this, the straps are durable, reinforced and makes take the product off very easy. Alongside this, the nylon material is rip-resistant and designed to be fully waterproof, so no way can water ever enter or damage your golf bag. If cost is a concern, this product is priced very well and worth considering. Plus, the value that you get for this product is well worth it. The overall design, the easy access zippers, and the quality material design add to this products construction benefits. If you are looking for value and benefits, this is the item to get. Do you want to know what is also the most unique aspect of this product? It also comes in a bright red color tone! Installs in two easy steps. Adjustable straps for quality installation. Comes in two color choices. Can be a bit heavy when wet. A bit bulkier than most. We are coming close to the end of our list! This rain cover happens to be very simple, lightweight, and not boast a bunch of the features as other covers. However, it still does the job or protection your gear really well. Here are two features of the Adidat Waterproof PVC Rain Cover and what individuals will benefit from as far as value and design. This product is designed with an easy installation benefit. The easy installation design allows for the golfer to be able to place it on the bag without any problem effortlessly and simply. Alongside this, the individual can install the product without much effort and take it off, clean it, and wrap it back up and store it away. This item is designed for what it is intended for, protection from water. It protects your golf gear when you need it most because of the PVC material. To add to this, it is very durable, constructed to be easy to clean, and it is made with a simple snap-button design for easy adjustment and use. Although not as high-quality as other brands, it sure is affordable. If you are not looking for the top of the line cover in the industry, this one comes in handy. If you want a simple cover that will protect and be easy to clean and store, this is it. Quality cover that fits most bags. Protects your gear from rain. Snap-on design is easy to use. Easy access to your equipment. Material is a bit cheap. This next bag is much like the last on our list, but instead of snaps, it comes with a zipper. The Stowmatic Waterproof Cover is designed for quick and easy placement and coverage of your gear when it starts to rain. It can be placed on your gear easily and the design is a quality design that is easy to use and easy to take off. The zipper of this product is durable, high-quality and made to last. The zipper is reinforced for quality use and durability. It also is made to be rust-resistant and not wear and tear easily as many other rain covers do. 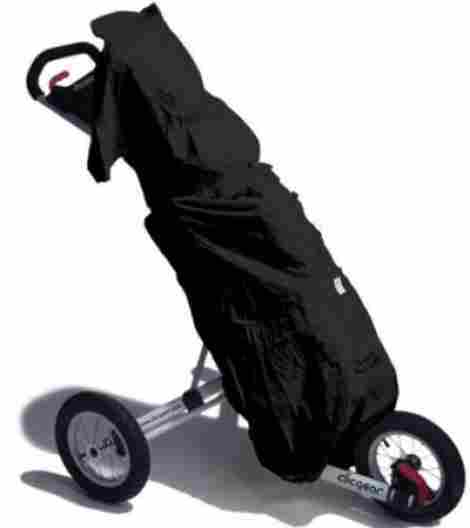 Overall, this cover is beneficial and great for the starter golfer. Alongside the benefit that this cover is great for starter golfers, it also is easy to use. Simply unpack it, pull it over your golf bag, zip it up, and head to the course. When it’s done raining you can take it off, wipe it down, and put it inside of your bag and it will stay safe and not tear easily. As far as the price, this product is easy to install, safe to use, and comes in an easy package that makes it setting it up easy. It is from a great brand that is trusted and overall it has positive reviews. The price is also less than most brand, which comes in handy. The material is thin and lightweight. Will crack easily if stored for too long. This is the last product on our list and it happens to be a rain hood that is easy to place and easy to use. The Izzo Golf Bag Rain Hood is a simple product that protects the head of your clubs from the mist and light rain. Made from a trusted brand, here are two features we want to share regarding this item. 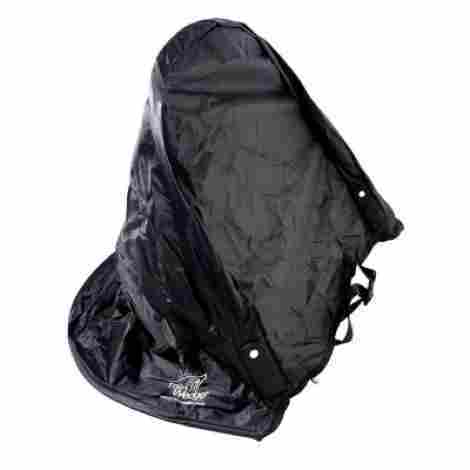 This product is not a full rain bag cover, it is more of a rain cover for the top of your bag. If it blowing away is a concern of yours, do not worry. This product actually has an attachment latch that easily attached to the stand bag top or handles, so it does not blow away. This item is an easy setup design that protects your golf gear when you need it. When not in use, just take it down, fold it up and place it back inside of your bag pocket. Overall, it is a simple and beneficial product for light days of rain. If it is not raining a lot and you do not want to take out a full bag protector, this is the next best thing. It simply protects your club heads. Overall, it is nowhere near as high quality as other products, but it is worth considering due to the value of the product and the design. With this, we recommend this product to individuals that want a light and easy way to protect their clubs from light rain and also dust. Protects against light rain and dust. Easy to fold and remove. Not as effective as a full cover. So, if you are looking for a quality rain cover, this is the list to consider. There are many different products, so, as we said in the beginning, it is important to pick the right one for you. Are you wanting wind protection as well? Are you looking for full protection or just golf club protection? All of these features and more are important to keep in mind. Now that we have discussed the ten best covers for your rainy day, we want to discuss the criteria. Our criteria are our rules and guidelines for helping us select the best product. During the selection process, we normally take into consideration different features about each product and from there create criteria that we can share with the audience for selecting the best product. So, if you want to evaluate the best rain cover with us, let’s keep reading. If you are looking to protect your golf equipment from the rain, it is important to consider which product is the best for you. In this criteria, we want to cover the different aspects, features, material design, and most important elements to consider in selecting a quality product. We fully understand what your main concern is, to ensure the product works well and to ensure that it also is designed for long-term use. Well, we are covering all of these bases and more. Let’s start with the first one. The material of a rain cover is by far the most important aspect to consider. The reason being is that a quality rain cover will be designed to withstand plenty of wear and tear, rain and wind included. With that in mind, we want to discuss the two most common materials that a cover is made from. With this, consider the design, the benefits, and the overall value of this material. Most covers are made of nylon. Now, if you are unfamiliar as to the benefits of nylon we will discuss a couple. Nylon is one of the highest quality and durable fabrics in the industry. It is not a quality fabric as far as luxury and premium feel, it is a quality fabric in terms of durability and resistance. For instance, nylon is incredibly worn and tear resistant. If made properly, it can even be rip resistant as well. With this, nylon is a common fabric among brands that design specific products such as golf bags, golf cart covers, etc. Nylon, in this case, is primarily used for the purpose of how durable it is and how rain resistant it is. This material is also incredibly tough while also being very easy to fold. This next material is not as durable as nylon, but it can withstand the rain and wind elements if designed correctly. PVC plastic is not the safest of materials. However, if you consider the specific benefits of this material, individuals can expect this material to be durable, rain-resistant, and easy to fold. The only downfall is that it can get cut easily, and if you fold it for long periods at a time without use, it can actually crack. However, this is the second most common material of a golf bag rain cover. As the second aspect to consider, the design features is another important and crucial aspect of selecting the best quality cover. With that, we want to break down a couple of design features of a rain cover and what individuals can look forward to when selecting a quality cover. Most zippers that are in the industry for this type of product happen to be designed to be rain resistant. A rain resistant zipper is crucial because it ensures longevity alongside the fact that the product will be very durable. Keep in mind that not all zippers will be rain resistant and the cheaper the product is the fewer quality materials it will be as well. This was a very unique feature that we encountered, but some brands even design their bags with various zippers that are in specific areas where a bag pocket would be. 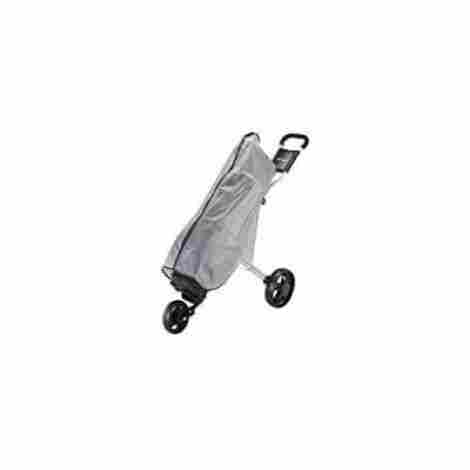 This allows individuals to have easy access to important items that they may need from their golf bag. Some covers are designed from an elastic band design. The elastic band design is intended to secure the cover even more. With that, the elastic band allows for individuals to be able to secure the cover to the bag without worry of wind or rain getting inside. Alongside this, most bands are made of spandex for an elastic and comfortable fit that is easy to take off and place on. Other different types of closure systems include closure systems that are designed as snap-buttons or from Velcro. With this, these systems are most common among brands that create more affordable products. To keep that in mind, snap and Velcro closure systems are not as rainproof as a zipper. As the last criteria, we want to discuss, we want to share with our audience the most common cover styles that there are. There exist two types of covers to choose from. These covers range in size and quality. However, these are the two most common styles. A full bag cover is a cover that is designed to cover the entire bag. This design allows for the product to receive full coverage from the rain, wind, and dust. With this, this type of cover can sometimes be too big to store inside your bag, especially if you do not have the pocket space. This next cover is most commonly the cheapest that there is. This is known as a “hood” cover. 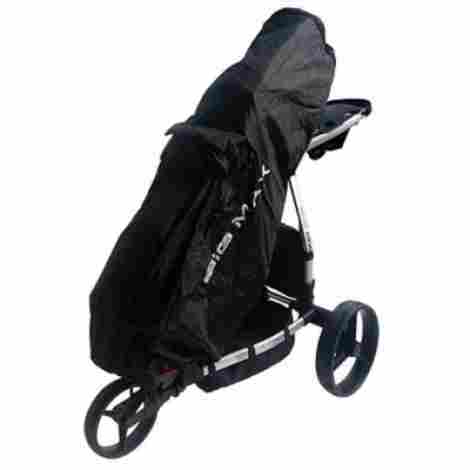 This design acts only as a hood or umbrella that covers the top area of the golf stand bag. With that in mind, individuals can expect the hood to cover to only be able to resistant light rain and wind. Also, it does not cover your full stand bag, so if you expect to use it during heavy rain, expect your Callaway bag to get really wet. As the last criteria on our list, it is important to consider the price and what you get for the design of your rain cover. Most commonly, a quality rain cover will be as cheap as $20 and be as costly as $50. However, before hitting the purchase button, consider the specific design and what reviews have to say about that product. In our case, we focus solely on products that are above four stars. With that in mind, let’s move forward and answer some of the most common questions. Q: Can you dry the cover easily? A: Yes! A rain cover is designed for it to be rain resistant and for it to wick rain away. With this, you can easily dry it by using a towel. Now, as far as the material, nylon will be more rain wicking than PVC plastic and you may encounter more water on plastic covers compared to nylon covers. Q: Is the hood wind resistant? A: Hoods are not as rain resistant or wind resistant as full covers. With this, they often have a latch system where an individual can connect the cover via a latch to the handle of the bag, so it does not blow away. Q: What is best for travel? A: If you are traveling with a golf bag and you are looking for a rain cover, we recommend a nylon cover compared to a PVC cover. A nylon cover can withstand more wear and tear and since it is a fabric, is more resistant during travel. Although it may be heavier compared to a plastic cover. Q: Are the snap closures rust resistant? A: Metal snap closures on a rain cover tend to be used because it is more affordable than a zipper. With that, snap closures are not as durable and they are not water resistant and will rust eventually.